All work tasks should be reviewed and if necessary reorganized to ensure that human-machine collaboration is as effective as possible. Insurers looking to artificial intelligence (AI) to improve their underwriting need to be smart about how they introduce this powerful technology to their workforces. Collaboration between underwriters and AI, as I mentioned in my previous blog post, has huge potential. It can improve substantially the effectiveness and performance of underwriting professionals. Our research shows that more than 75 percent of insurers plan to use AI to automate tasks in the next three years. Fifty-two percent believe collaboration between their workers and machines will be important as they strive to achieve their strategic priorities. Around 66 percent of insurers believe AI will improve workforce productivity and 98 percent intend to use this technology to enhance the capabilities of workers. When we canvassed insurance employees, we found that 30 percent of them are already working with intelligent technologies for more than half their time at work. This is certainly set to increase. Insurers are applying AI to tasks across their organizations. Moves to introduce AI to enhance underwriting, therefore, need to be in step with broader corporate strategies. They should be aligned with other key business functions such as marketing and sales, administration, claims, customer services and recruitment. It’s vital that insurers planning to roll out AI in their underwriting departments, and elsewhere in their organizations, thoroughly prepare their workforces. This requires more than just training and skills development. All the work performed by employees needs to be reviewed and where necessary reorganized so that human-machine collaboration is as effective as possible. Earlier in this blog series I discussed how AI can help underwriters manage the huge volumes of data available to them and also guide them to make better, quicker decisions. A further important consideration when reorganizing the workforce to harness the power of AI is the potential of this technology to encourage employees to adhere to the company’s principles, policies and processes. AI, through multiple checks and prompts, can regularly remind each employee of the culture and values of their organization. While many insurers recognize the growing importance of the collaboration between workers and intelligent machines, few have adopted a systematic approach to fostering this relationship. We’ve identified three essential steps. Assess tasks, not jobs: Identify the tasks that need to be performed. Evaluate the skills and technologies available and then allocated tasks to people, machines or a combination of the two. Evaluate performance to detect and correct anomalies. 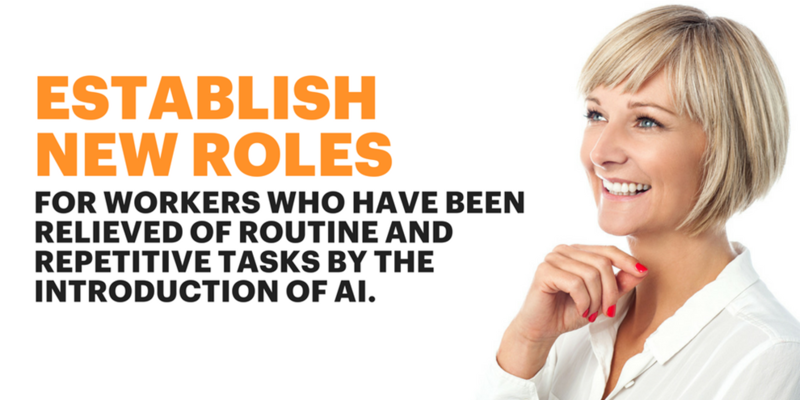 Create new roles: Establish new roles for workers who have been relieved of routine and repetitive tasks by the introduction of AI. These roles will tend to require insight and intuition as well as a combination of specialist skills. Map skills to new roles: Align the workforce to the new roles and tasks. Introduce training and hire contractors to overcome skills shortfalls. Keep the reconfiguration of roles flexible so that skills can be redeployed when necessary. In my next blog post, I’ll discuss why insurers must safeguard the veracity of the data delivered to their AI systems. Until then, take some time to look at these links below.